Ah, the garden is so lovely at this time of year. The roses and clematis are giving a great show. Lettuce, kale and spinach have been so delicious. Pea pods are forming and ready to be plucked and eaten right there in the garden! The first flowers are now appearing on peppers and tomatoes!! Everything is looking just superb right now. 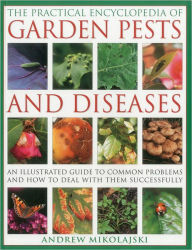 So why have I chosen The Practical Encyclopedia of Garden Pests and Diseases, An Illustrated Guide to Common Problems and How to Deal With Them Successfully to review this month? Because if you aren’t diligent and observant every day, the ‘good times in the garden’ could be short-lived. A few of you have already had a winter moth caterpillar infestation. And the temptation is to DO SOMETHING RIGHT NOW. Where we have plants, we are guaranteed to have pest and diseases. So, “Forewarned is Forearmed” as they say, or “Let’s educate ourselves about any problems, diseases, and pests when they appear in our gardens.” This fabulous light-weight book with over 925 photographs is just what you need to do so. This is a visual encyclopedia with over 750 of those pests, diseases, viruses, and other problems identified by photo and description. There are reasons why you may be having a problem and suggestions for dealing with it whether biologically, organically, or chemically* are spelled out here. (*As Master Gardeners we do not recommend chemical warfare in our gardens). The detailed introduction to the book defines what a pest is, we aren’t talking about groundhogs and deer this time, but instead, the various forms of insect pests or disease. The introduction goes on to describe how to distinguish a disease or insect problem from physiological problems caused by the site, soil, our own negligence, or weather. The author also includes lawn, pond, and weed problems. Best of all, information is given so that you will be able to encourage natural predators into your garden to achieve a healthy balance between your plants and beneficial wildlife. I highly recommend this book to all gardeners. The only negative is that while my paperback is smallish and easy to take out to the garden, the small print and photos may be difficult for some to read. There is a hardcover version that is larger, but also more expensive, unless you purchase a used copy. The author, Andrew Mikolajski is author and co-author of over 20 gardening books. He is a member of the Garden Writers’ Guild and has written for the magazine Gardens Illustrated.